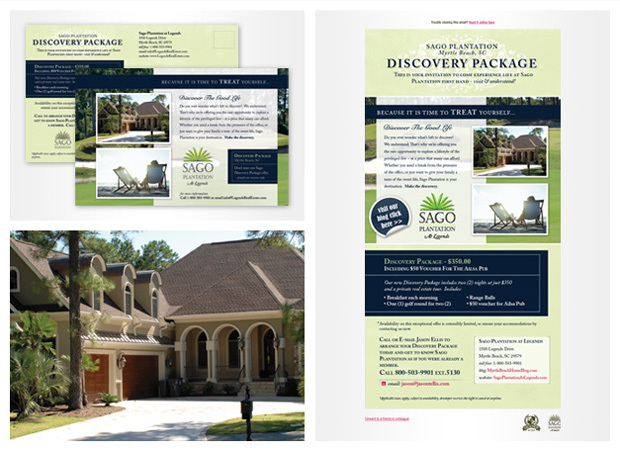 Inkhaus was asked to develop an ad campaign for Sago Plantation at Legends. Recent shifts in our local market demanded a campaign driven by innovation, with accountability at its core. The campaign started with a print mailer and was followed up by an e-newsletter. With custom email marketing the client was able to see real time stats on how many emails reached their target destination, who viewed the email, how many times they viewed, and which links were visited from the newsletter. Our clients are happy to report that they received solid leads directly from this campaign ~ real estate tours were booked, driving business to these developments. This kind of campaign is effective because it is designed to sort those prospects who are actively interested in investing. Looking for a golf weekend getaway? Interested in the package offer? Visit MyrtleBeachHomeBlog.com for more details.